Daily Illuminator: Forget The Mashed Potatoes; This Means Something! September 26, 2011: Forget The Mashed Potatoes; This Means Something! Ever since I watched Close Encounters of the First Kind as an impressionable child, I've never been able to think of vowels without singing them to that movie's iconic five-note theme. "A-E-I-O-U . . . A-E-I-O-U . . ."
This random thought brings us -- tangentially -- to the latest issue of Pyramid, newly released upon an unsuspecting public. 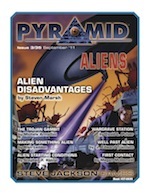 Pyramid #3/35: Aliens turns its unblinking gaze squarely on the subject of extraterrestrials. It includes a bunch of new life forms to encounter (or flee), a look at how to tweak GURPS Basic Set disadvantages to make them strangely exotic, and additional insight into how to make memorable aliens. It also features a new stellar graveyard from the mind of GURPS Fourth Edition architect David Pulver (complete with an unusual GURPS Spaceships vessel). If you're looking to expand the universe's vast storehouse of otherworldly knowledge begun in GURPS Space, you need to set your tractor beam on Pyramid #3/35: Aliens. Extraterrestrial encounters aren't limited to A-E-I-O-U; the good stuff comes from the "why"!